Tomorrow is the tenth anniversary of the release of Halo: Combat Evolved. Arguably the most influential video game of the past decade, the first installment of the Halo series drew in millions of loyal players with its combination of breathtaking beauty, tactical ability and mythology on a vast scale. Fittingly, tomorrow will herald the arrival of Halo: Combat Evolved Anniversary in stores. It's the original game with remastered graphics for the high-def Xbox 360 (and you can even switch between the look of the 2001 Xbox game and compare it to the shiny new veneer). But one clever dude named Ed Fries has decided to go really old-school in the classiest way possible: adapting Halo: Combat Evolved as an Atari 2600 game! 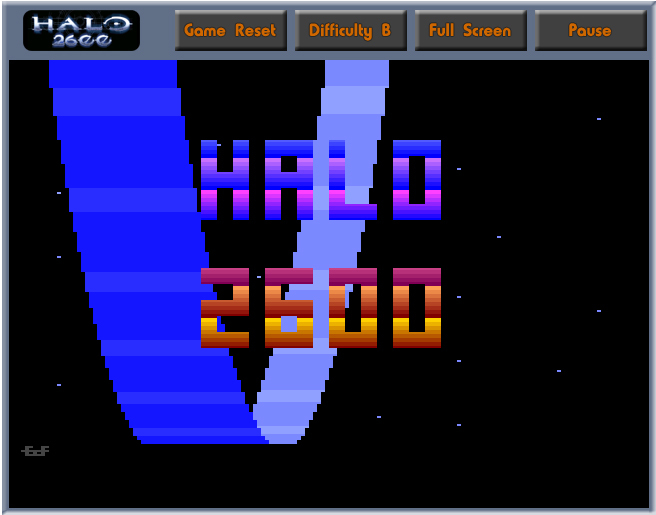 Yes it's true: Halo 2600 lets you guide Master Chief along on the surface of Halo in his fight against Grunts, Elites and other forces of the dreaded Covenant in all the glorious graphics that 1977's technology had to offer. It's quite a charming lil' conversion, be you a die-hard Halo fan or nostalgic for the 2600 (or both, like me :-) Check it out!